A mainstay on Manhattan’s Upper West Side, the Robert Stuart Salon has thrived during 20 years of economic distress, surplus, and everything in between. When the Valerie and Robert Rosenthal decided to expand their small boutique salon into a full-service establishment and relocate, Valerie consulted the Columbia-Harlem SBDC for assistance in getting a loan. Securing financing and relocating the salon was not as easy as Valerie anticipated, even with the long, strong history of the business. In addition to being turned down for financing from their home bank, the Rosenthals seriously considered four locations before settling on new space. SBDC Director Rebecca Rodriguez helped Valerie review non-traditional financing options, and determined that the salon was eligible for the second-look program, which was established to give entrepreneurs denied financing on their first request another opportunity to secure funding. Valerie closed on a $200,000 loan from New York Business Development Corporation and is developing the new salon to fit the couples’ vision. 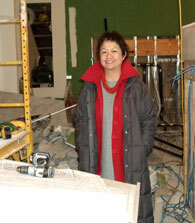 The new salon will be 2.5 times larger than the old one, which will enable the Rosenthals to double their staff. Though Valerie consulted the SBDC about financing, she also received useful advice for other areas of her business. She noted that “The SBDC awakened me to view my business with different eyes and explore options I may not have considered otherwise”. The SBDC helped Valerie explore energy efficiency through the NYSERDA program, identify grant sources to underwrite employee training, and establish a more strategic plan for business operations.